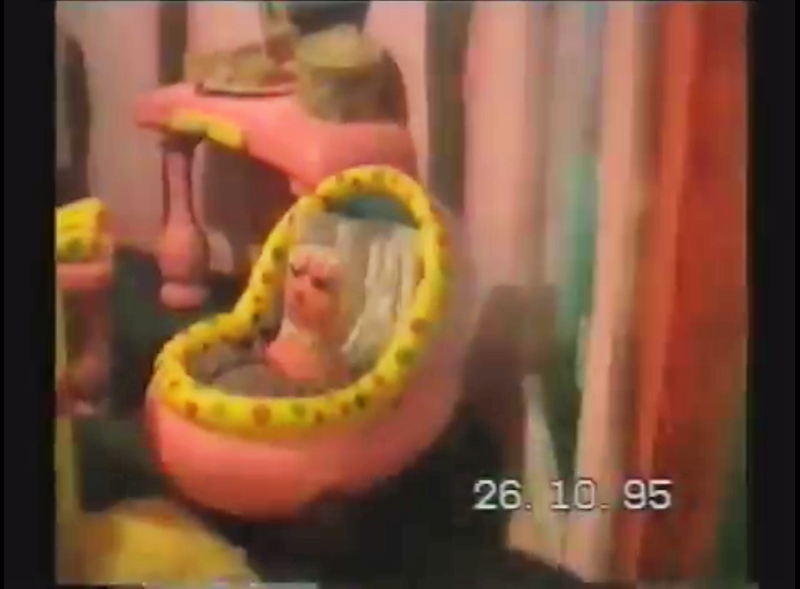 Mr Blobby had it all in the early 1990s. He was on the BBC's flagship primetime Saturday night TV show, he had a Number One single and most importantly, he had a theme park. In fact, the theme park was so important that he lived there! 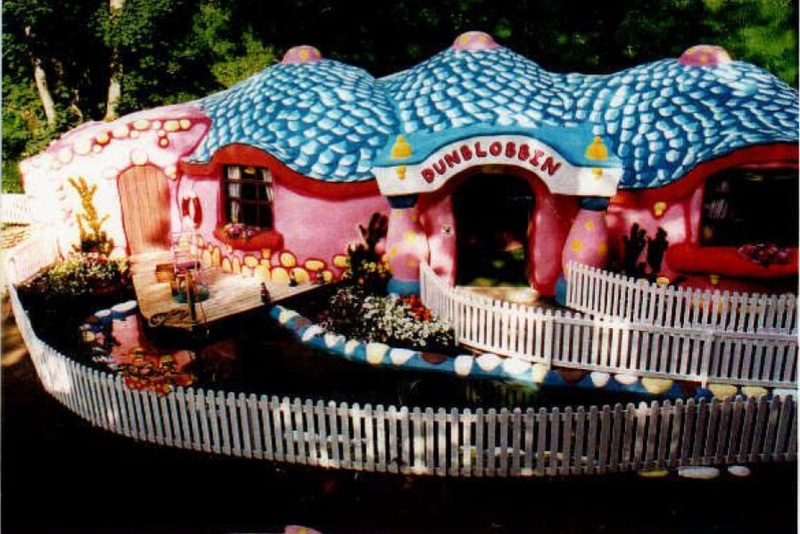 Dunblobbin was located on the outskirts of Cricket St Thomas park, furthest from the entrance point at the time. It was close to the train station, and was built in an old quarry that had previously been used to house monkeys as part of the safari park. Built in early 1994 out of chickenwire and polystyrene, the house was a higgledy-piggedly bungalow with its own lake, garden and decking. There was a small yellow bridge to cross in order to enter the front door. Access to the whimsical house was via a small tunnel, marked with the letter 'B'. The exterior of the house was both comical and endearing. 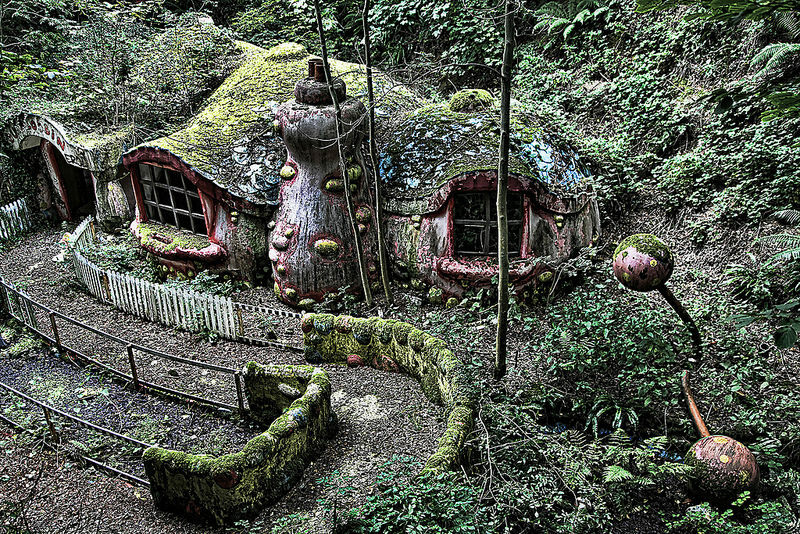 Plastic flowers adorned the window sills, and giant pink mushroom-like plants emerged from the undergrowth. 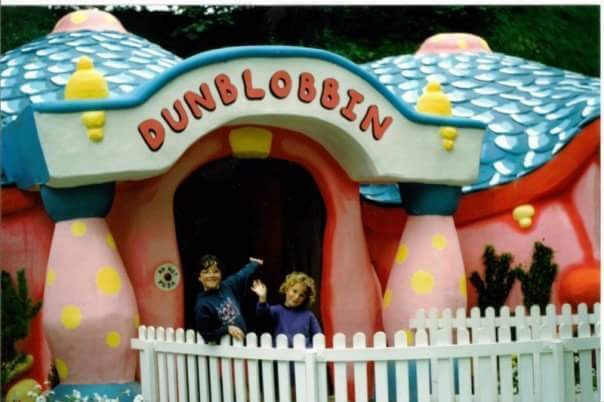 The door of Dunblobbin remains the most photographed feature of Crinkley Bottom, as visitors flocked to its doors to get pictures in front of its iconic entrance. 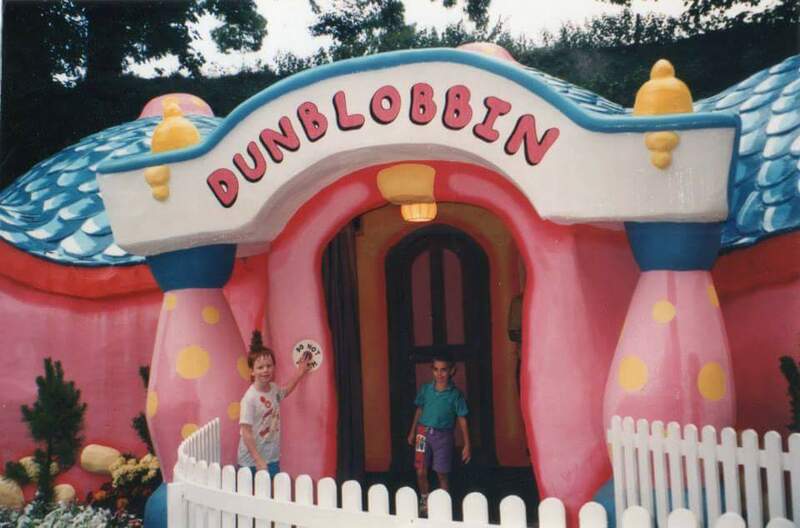 Just by the front door of Dunblobbin was a doorbell, which could be pressed to hear the shrill cry of 'Blobby blobby blobby!'. Neighbours cursed the house, as the jaunty Mr Blobby theme and the irritating doorbell could be heard beyond the park and by those living nearby. 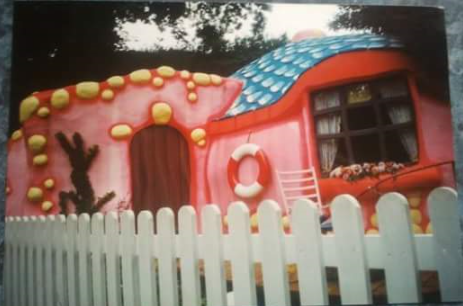 Once inside the house, visitors could walk around Mr and Mrs Blobby's family home. 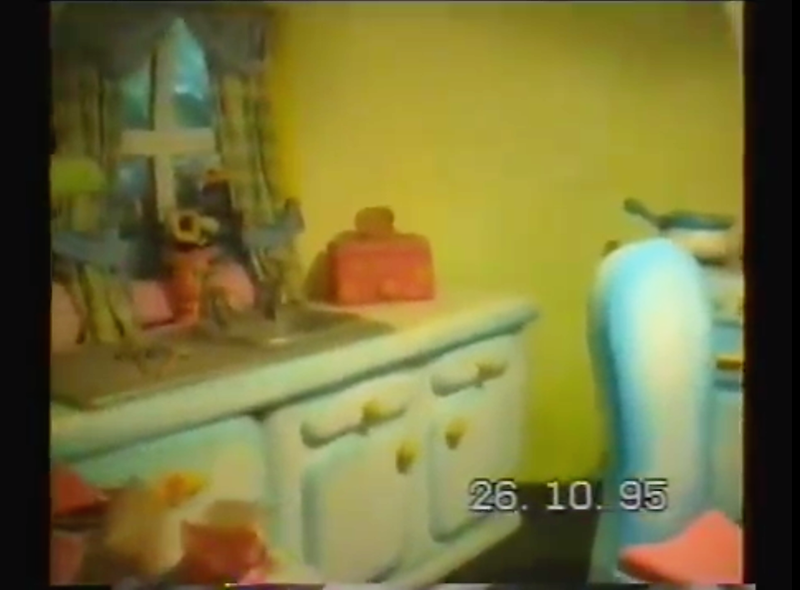 The first room was the lounge, featuring a sleeping dog, a Blobby television set, record player and lamp, and a blobby fish in a blobby fish bowl. Next was the kitchen, a crazy mess of cake, Blobby Flakes and a food mixer that seemed to be mixing gunge. 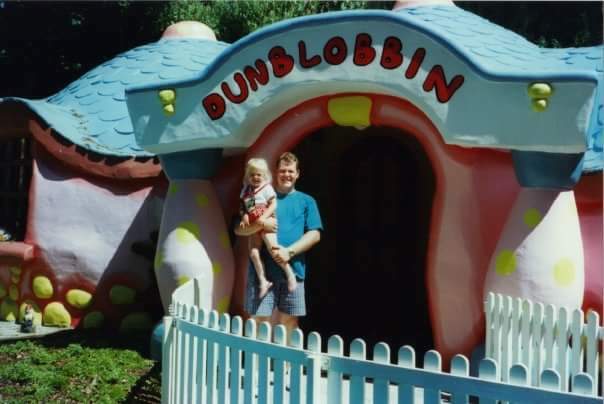 Then there was a long corridor, which housed the Blobby family bathroom. 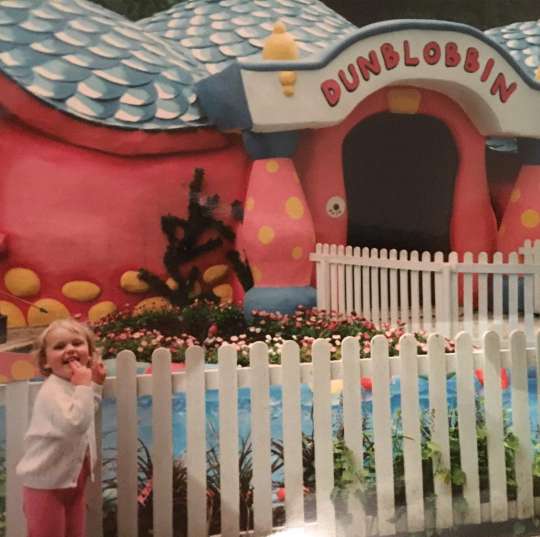 With its pink and yellow toilet, curvy mirror and Blobby in the shower, it made a memorable impression on all small children! 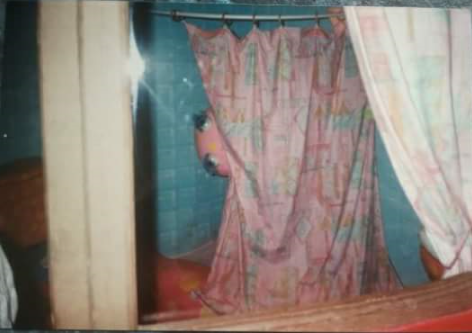 Quite why Mr Blobby was shy in being seen in the shower when he normally only wore a tie was never made clear. 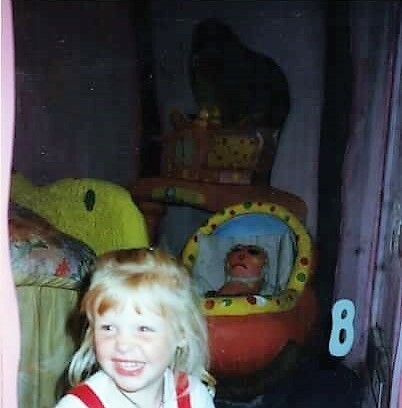 Further down the corridor lay the final room, Mr Blobby's bedroom. With its loud alarm clock noise ringing constantly, Blobby lay snoring in bed, along with a bizarre row of small animals sleeping alongside him. The baby Blobby wailed in its cot, rocking side to side. It was a dramatic scene! 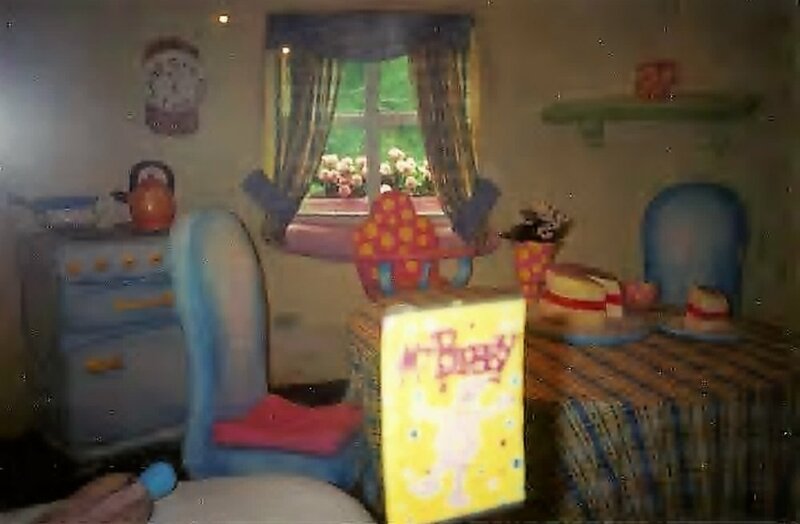 Mr Blobby wasn't to everyone's taste and so when footfall on Crinkley Bottom dropped sharply during the 1997 season, it was decided to close Mr Blobby's House along with Blobbyland and remove all mention of Noel Edmonds' involvement with Cricket St Thomas. 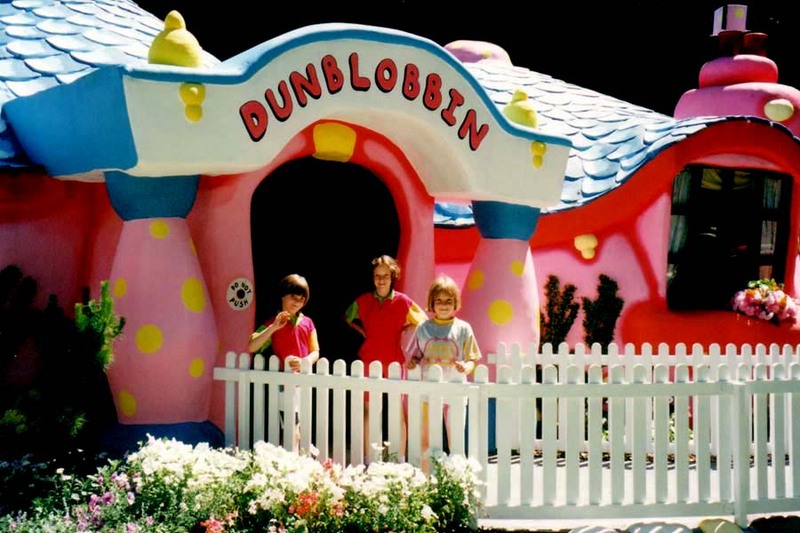 For reasons unknown, Dunblobbin was left intact, closed to the public. Day by day the site was taken over by nature, until one day in 2009 some urban explorers posted photos of the site online. With the site overgrown and decayed, it caught the attention of the British press, who described it as being trashed by ravers during an illegal rave. 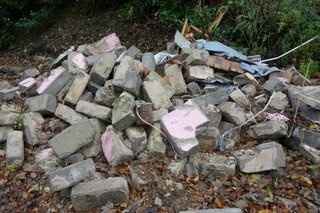 You only need to examine the photos for a few moments to realise that nature was the force behind Dunblobbin's demise. The illegal rave myth was originated by a post on an urban exploration forum, which in true Daily Mail style was taken to be true and milked for all it was worth. The children of the 90s who visited the park or were fascinated by its existence began trespassing on Cricket St Thomas' grounds to witness the spectacle, often taking parts of the house with them. By 2014, pretty much any item that Dunblobbin contained that could be carried, stolen or broken had been removed or damaged, and graffiti covered the walls. Frustrated by the number of unwelcome visitors, Cricket St Thomas staff attempted to block the tunnel, first with machinery and then a wooden fence. But still people came to explore. Eventually, in mid-2014, the house was razed to the ground and the tunnel totally blocked with breezeblocks, preventing any further intruders. 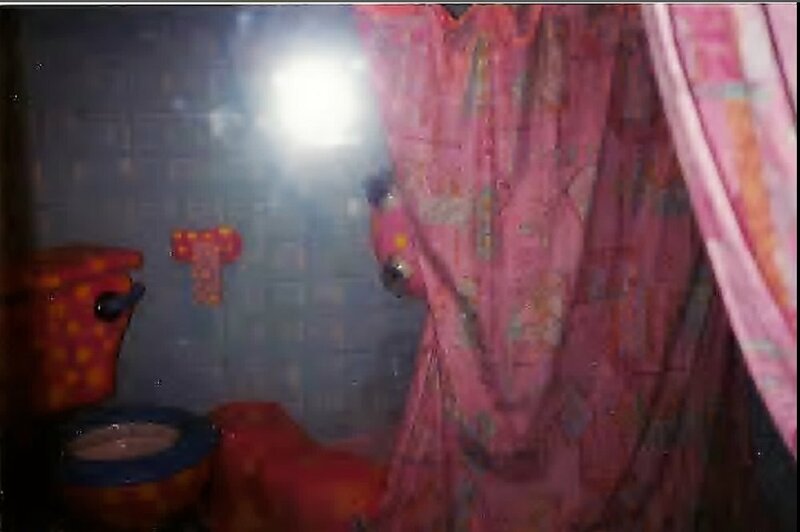 Individual whereabouts of the items contained in Dunblobbin are not known, although the toilet was taken away to feature in an art gallery for a while. It was a sorry end to such an iconic and bizarre feat of British popular culture. 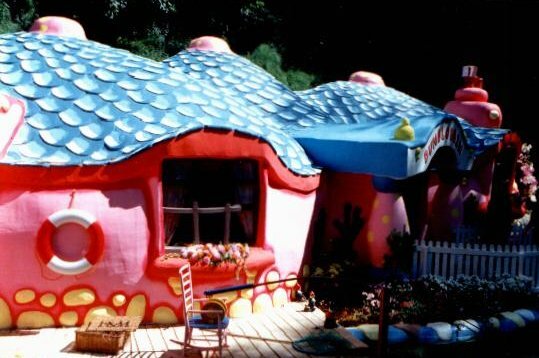 Do you remember mr blobby's hoUSe? If you have any photos, videos or memories you'd like to share, please contact us.